We are engaged in the manufacture of high-quality Eye Bolts. They are made using premium-quality raw materials at our spacious infrastructure unit in compliance with industrial norms and guidelines. Clients can get them from us in customized shapes and sizes. They are highly acclaimed for their resistance to corrosion and abrasion. Their sturdy designs make them highly durable. They are available with a loop and thread on one end to enable instant attachment to a string. They are available in different varieties like stainless steel, threaded etc. They are quality-tested by professional auditors before dispatch. 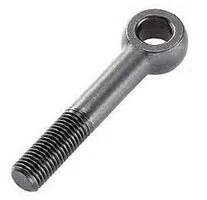 These bolts are used widely for attaching cables to objects and other fastening purposes. We offer them to our clients at reasonable prices. We undertake bulk delivery for the product as well. We are engaged in manufacturing and supplying a wide assortment of MS Gland Eye Bolt. 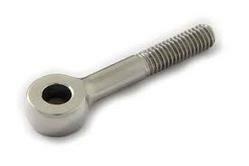 Our provided eye bolt is obtainable from us in frequent customized options to choose from. This eye bolt is tested by our team of experts on several parameters so as to deliver a fault free range. 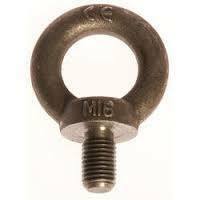 In addition, this eye bolt is used for attaching cables to objects and other fastening purposes. With highly driven technical excellence and advanced infrastructure, we have been able to offer our clients a vast array of SS Eye Bolt. 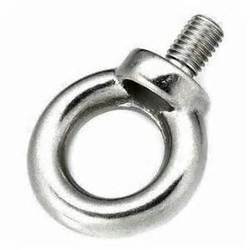 These offered eye bolts are manufactured in fulfillment with the set quality norms by utilizing optimum quality material and latest techniques. Our eye bolts are acclaimed in the market owing to its fine finishing. We are providing these eye bolts in assorted dimensions & sizes details specified by clientele. In order to uplift and preserve our reputation as the reliable manufacturer and supplier in this domain, we are devoted towards offering SS 304 Gland Eye Bolt. These eye bolts are precisely manufactured by our talented workforce using finest grade material, at par with the market prevalent standard. We are giving these eye bolts in numerous sizes and dimensions, as per the requirements of our patrons. As well, patrons can avail these eye bolts from us in bulk order in quality packing within a given time frame. 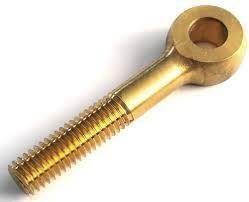 We are one of the distinguished Manufacturers and Suppliers of the best quality Brass Eye Bolts. Our Eye Bolts are extensively used in oil field operations and vibration systems, etc. The Eye Bolts, offered by us, Are widely acknowledged for their quality finishing, Corrosion resistant and excellent dimensions. We are one of the distinguished Manufacturers and Suppliers of the best quality Stainless Steel 316 Gland Eye Bolts. Our Gland Eye Bolts are extensively used in oil field operations and vibration systems, etc. The Eye Bolts, offered by us, Are widely acknowledged for their quality finishing, Corrosion resistant and excellent dimensions. We are one of the distinguished Manufacturers and Suppliers of the best quality Stainless Steel 202 gland Eye Bolts. Our gland Eye Bolts are extensively used in oil field operations and vibration systems, etc. The Eye Bolts, offered by us, Are widely acknowledged for their quality finishing, Corrosion resistant and excellent dimensions. We are one of the distinguished Manufacturers and Suppliers of the best quality SS 316 Eye Bolts. Our Eye Bolts are extensively used in oil field operations and vibration systems, etc. The Eye Bolts, offered by us, Are widely acknowledged for their quality finishing, Corrosion resistant and excellent dimensions. We are engaged in the manufacture of high-quality stainless steel 304 Eye Bolts. They are made using premium-quality raw materials at our spacious infrastructure unit in compliance with industrial norms and guidelines. Clients can get them from us in customized shapes and sizes. They are highly acclaimed for their resistance to corrosion and abrasion. Their sturdy designs make them highly durable. They are available with a loop and thread on one end to enable instant attachment to a string. They are available in different varieties like stainless steel 304 , 316 etc. They are quality-tested by professional auditors before dispatch. 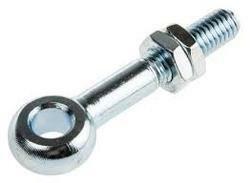 These bolts are used widely for attaching cables to objects and other fastening purposes. We offer them to our clients at reasonable prices. We undertake bulk delivery for the product as well. Our efficient teams help us engage in the manufacture of Grade 10.9 Gland Eye Bolts. They are made using superior quality raw materials like en 19 , 4140 ,stainless steel, mild steel etc. and are well-known for their resistance to corrosion and abrasion. Their surface has a flawless finish. They are designed to ensure superior sturdiness. These bolts have a thread and loop on one end to enable quick and easy attachment of a string. They are used for leveling various frame works. They also facilitate easy attachment of cables to various objects with ease. Clients can avail them from us in customized shapes and sizes at reasonable prices. They are approved by our quality auditors before dispatch. We deliver them to our clients in efficient packaging. Our efficient teams help us engage in the manufacture of Grade 8.8 Gland Eye Bolts. They are made using superior quality raw materials like en 8, stainless steel, mild steel etc. and are well-known for their resistance to corrosion and abrasion. Their surface has a flawless finish. They are designed to ensure superior sturdiness. These bolts have a thread and loop on one end to enable quick and easy attachment of a string. They are used for leveling various frame works. They also facilitate easy attachment of cables to various objects with ease. Clients can avail them from us in customized shapes and sizes at reasonable prices. They are approved by our quality auditors before dispatch. We deliver them to our clients in efficient packaging. We are engaged in the manufacture of high-quality mild steel Eye Bolts. They are made using premium-quality raw materials at our spacious infrastructure unit in compliance with industrial norms and guidelines. Clients can get them from us in customized shapes and sizes. They are highly acclaimed for their resistance to corrosion and abrasion. Their sturdy designs make them highly durable. They are available with a loop and thread on one end to enable instant attachment to a string. They are available in different varieties like stainless steel, threaded etc. They are quality-tested by professional auditors before dispatch. 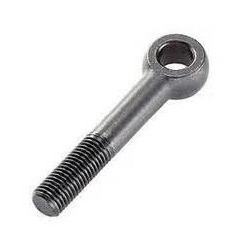 These bolts are used widely for attaching cables to objects and other fastening purposes. We offer them to our clients at reasonable prices. We undertake bulk delivery for the product as well. 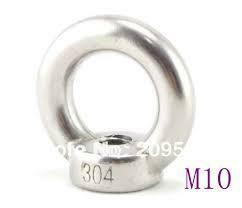 We are one of the distinguished Manufacturers and Suppliers of the best quality SS 304 Eye Nut. Our Eye Nut are extensively used in oil field operations and vibration systems, etc. 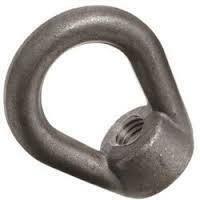 The Eye Nut, offered by us, Are widely acknowledged for their quality finishing, Corrosion resistant and excellent dimensions. We are one of the distinguished Manufacturers and Suppliers of the best quality SS 316 Eye Nut. Our Eye Nut are extensively used in oil field operations and vibration systems, etc. The Eye Nut, offered by us, Are widely acknowledged for their quality finishing, Corrosion resistant and excellent dimensions. We are one of the distinguished Manufacturers and Suppliers of the best quality MS Eye Nut. Our Eye Nut are extensively used in oil field operations and vibration systems, etc. The Eye Nut, offered by us, Are widely acknowledged for their quality finishing, Corrosion resistant and excellent dimensions. 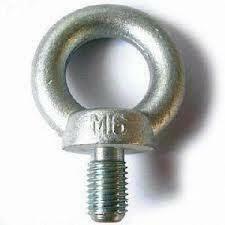 We are one of the distinguished Manufacturers and Suppliers of the best quality High tensile Eye Bolts. Our Eye Bolts are extensively used in oil field operations and vibration systems, etc. The Eye Bolts, offered by us, Are widely acknowledged for their quality finishing, Corrosion resistant and excellent dimensions. Our efficient teams help us engage in the manufacture of Grade 12.9 Eye Bolts. They are made using superior quality raw materials like en 19 , 4140 , etc. and are well-known for their resistance to corrosion and abrasion. Their surface has a flawless finish. They are designed to ensure superior sturdiness. These bolts have a thread and loop on one end to enable quick and easy attachment of a string. They are used for leveling various frame works. They also facilitate easy attachment of cables to various objects with ease. Clients can avail them from us in customized shapes and sizes at reasonable prices. They are approved by our quality auditors before dispatch. We deliver them to our clients in efficient packaging. We are one of the distinguished Manufacturers and Suppliers of the best quality SS 304 Eye Bolt. Our Eye bolt are extensively used in oil field operations and vibration systems, etc. The Eye Nut, offered by us, Are widely acknowledged for their quality finishing, Corrosion resistant and excellent dimensions. 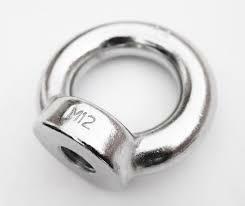 We are one of the distinguished Manufacturers and Suppliers of the best quality M.S Eye Nut. Our Eye Nut are extensively used in oil field operations and vibration systems, etc. The Eye Nut, offered by us, Are widely acknowledged for their quality finishing, Corrosion resistant and excellent dimensions. Leveraging upon our vast industry experience, we manufacture and supply an assorted gamut of Stainless Steel DIN 444 Eye Bolts. These offered eye bolts are manufactured in fulfillment with the set quality norms by utilizing optimum quality stainless steel and latest techniques. Our eye bolts are acclaimed in the market owing to its corrosion resistant and excellent dimensions. 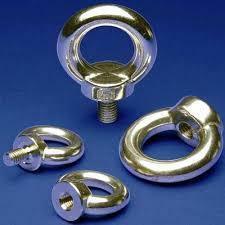 We are providing these eye bolts in assorted dimensions & sizes details specified by clientele. Looking for Eye bolts ?